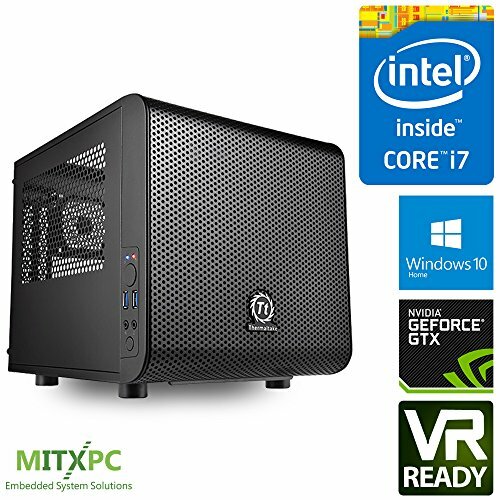 Part of the MITXPC Enthusiast-Series, this VR Ready Gaming PC is fully assembled with an NVIDIA GeForce GTX 1080 Ti Founder's Edition graphics card and Intel Core i7-7700 processor. Not for the faint-hearted, this Mini Gaming PC features top-notch, high-end components for the most demanding gamers. VR ready for a fully-immersed experience when paired with a VR headset. Beautifully enclosed in the Thermaltake Core V1 Mini-ITX chassis with 16GB system memory, 256GB M.2 NVMe SSD and 2TB storage drive and Windows 10 Home installed and ready for out-of-box operation. Complete System: Fully assembled and configured.